Motherhood.com.my by Nuren Group is a place for parents to shop for our essentials such as maternity, baby, toddler and kids. It also provides useful information on parenting, breastfeeding, product reviews, free samples and testimonials to help mothers to go through their motherhood journey. Sign up at HERE and you will get RM15 credit now with no minimum purchase. Motherhood.com.my is having a referral program. This is how it works. When you introduce Motherhood.com.my to your friends, your friends will get RM15 for the first sign up + RM10 multiply the number of friends that shop on Motherhood.com.my for the first time plus 5% credits from the total amount of your friends' shopping cart. Motherhood.com.my also launched a new campaign sponsored by Panasonic to giveaway 5 Lumix GF8 Camera worth over RM10,000.00. Just participate their "What Kind of Mom Are You" contest and you will stand a chance to win a Panasonic's new Digital Single Lens Mirrorless (DSLM) Lumix camera. Contest start from 6th June and ends on 15 July 2016. 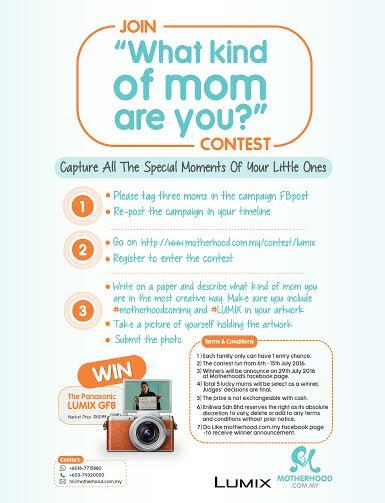 Start participate at this link at http://www.motherhood.com.my/contest/lumix/. Remember to sign up HERE to get your RM15 credit and get your friends to sign up too. 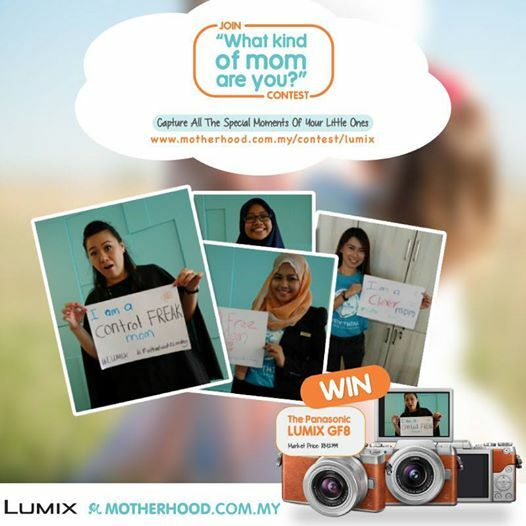 Join the contest and you might bring home the Panasonic Lumix GF8. Good luck to everyone here and hope all of you can earn more, save more and learn more on motherhood at www.motherhood.com.my. thanks for the information and the RM 15 voucher. Shet Ling, you're most welcome. Hope you get your friends to register too so that you can earn more too. Wow ! Very generous of them to giveaway a camera!! Michelle, indeed they are. U can try to join too and might walk-away with 1 of it. Good luck. Alia, Good luck to you too. OMG I wanna bring home the Panasonic Lumix camera T.T but I'm not a momma.. Fish, thanks for your support. You can earn too with the referral programme. Miera, you can join the referral programme to earn money and the contest to win away the camera. Gonna tell my sisters to join the contest. Thanks for letting me know about it. Looks really good! i will introduce to my friends who are mothers. thanks for sharing this good platform. Qian, you're most welcome. U can earn too with the referral programme. Not a parent myself but this is interesting! Gonna get all my parenting friends to join for the camera giveaway contest! awesome event!! !I wan the camera!!! !but too bad, i am not a mummy! !